If you are interested in having one of the Public Education Child Safety Inflatable's at your public event, Please fill out the request form below. 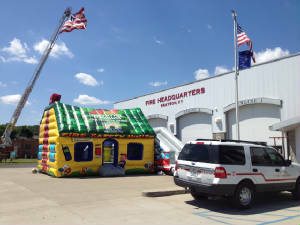 A safety house and a fire truck slide inflatable are housed in both Princeton at our Area 2 office and in Elizabethtown at the Area 5 office, and a safety house inflatable is housed in Morehead at our Area 9 office. More information about arranging an inflatable, please contact the Area 2 office at 888.306.7986, Area 5 office at 888.234.7201 or the Area 9 office at 888.301.2946. Click here for request form for Area 2. Click here for request form for Area 5. Click here for request form for Area 9. Form must be printed out, filled out completely and forwarded to the appropriate SFRT office by email or fax ONLY. 1. 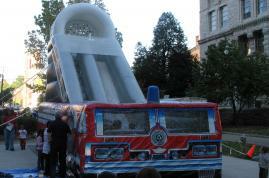 Only a Kentucky fire department in good standing with the fire commission may request the use of our inflatable. 2. These inflatables are for fire prevention or fire service related functions or public events with the fire departments participation. 3. Units are to be operated by the personnel of the fire department as a fire prevention tool. 4. The units will be delivered by state fire rescue training to the site of the activity. 5. The fire department shall provide for the set up, operation and tear down of the unit. 6. State Fire Rescue Training will pick up the unit following the activity. 7. These units are for public activities only. No personal use at residences or for events such as birthday parties, etc. is permitted. THE AVAILABILITY OF THESE PROPS IS VERY LIMITED AND COMPETITIVE IN AVAILABILITY AS THEY ARE USED STATEWIDE. PLEASE BE PATIENT AND HAVE UNDERSTANDING WHEN MAKING A REQUESTS. 3-6 MONTHS LEAD TIME IS APPRECIATED TO IMPROVE YOUR CHANCES OF AVAILABILITY.